This year, millions of people are feeling the urge to protest America’s broken political system by staying home on Election Day. It’s hard to blame them. In the last presidential election, just 60% of eligible citizens bothered to vote. And only 25% of young citizens ages 18-30 voted in the most recent midterm elections. Those numbers threaten to drop even lower in 2016. But our disgust for politics, to the point of throwing up our hands and sitting out entirely, threatens to harm us more than the circus itself. With news coverage dominated by a presidential spectacle, we risk losing sight of the importance of voting for candidates at all levels of government who will push for action on climate change—one of the most fundamental threats we face, according to the U.S. Department of Defense and 97% of scientists. If you think our politics are ugly, consider the plight of our dying planet. Millions of Americans live where the air is often too polluted to breathe safely; over half our streams and rivers are so polluted they are not safe for drinking, swimming, or fishing. Last year was the hottest since records began in 1850 and extreme weather—snow, drought, floods—are the new norm. Climate and weather disasters in 2012 alone cost the American economy more than $100 billion. Our communities are hurting as a result. Ask the people of Flint, MI, about fresh water. Ask the children with asthma in West Virginia about clean air. Ask the people of Vernon, CA, about contaminated soil, or the people working to rebuild their lives in Louisiana after unprecedented flooding exacerbated by climate change. They say all politics is local, but we don’t vote that way. Often, we just don’t vote. Most young voters feel disenfranchised and disillusioned by politics—but if they voted in full force, the politicians would have to take their issues seriously. Whether the media covers them or not, the politicians we elect to public office go to work once the campaigns end. Whether we respect the profession or not, politicians make decisions that affect our lives—from the local school boards to our municipal leaders to our state legislatures to Congress and the White House. This affects your community directly. Elections in every corner of the country this year ask voters to make important local choices that will influence whether or not Nevada residents have access to rooftop solar, whether or not a 600-mile oil pipeline will fracture forests from Virginia to North Carolina, or whether or not we’ll choose healthy oceans over convenience by banning single-use plastic bags in California, just to name a few. We shouldn’t let our distaste for our national politics lead us to believe the whole system is meaningless. In fact, we must put even greater weight on our rights and responsibilities as citizens. 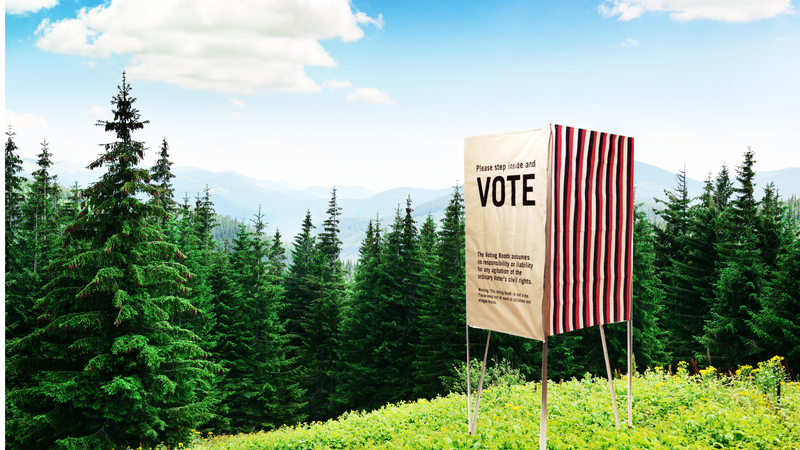 That’s why we’re closing all of Patagonia’s U.S. stores and offices in the United States on Election Day—to send a message to our customers, employees, and anyone else who might be listening: your vote counts, and the planet needs your participation, from city council to the presidency. Change happens through action, not by sitting on the sidelines. This country was born in protest by men and women who believed that citizens should decide their own destiny. Let’s act as citizens: stand up and loudly oppose the destruction of our air, water, and soil. The politicians who deny climate change and think they are smarter than 97% of the world’s climate scientists are either crooks or dumbasses. So why would you vote for them? Instead of taking a pass on this election, can we choose to vote purposefully for candidates—up and down the ballot—who support clean water, clean air, strong climate action and a courageous shift to renewable energy? Can we support candidates who will work on our behalf to save this planet from becoming too hot for human survival? In the end, government doesn’t move unless it’s pushed. This can be done by you and me or by the Koch Brothers or Wall Street or by the many corporate interests that try to buy candidates, year after year. If we don’t act, then someone else will—someone who doesn’t care about a future for our children and other wild things. Voting is direct action. In this election, protest indifference and vote for candidates up and down the ballot who will protect our planet. Yvon Chouinard is founder and owner of Patagonia, Inc., based in Ventura, California. He began in business by designing, manufacturing, and distributing rock-climbing equipment in the late 1950s. In the late 1980s, Patagonia’s success was such that Chouinard considered early retirement. However, he decided to continue directing Patagonia’s course, in part to use the company to inspire and implement solutions to the environmental crisis. As part of this goal, Patagonia instituted an Earth Tax, pledging 1% of sales to the preservation and restoration of the natural environment. In 2001, Chouinard, along with fly fisherman Craig Mathews, started 1% for the Planet, an alliance of businesses that contribute at least 1% of their net annual sales to groups on a list of researched and approved environmental organizations. Chouinard spends much of his time in the outdoors and continues to help guide Patagonia Works.